Learn about trends in the Auto Repair Business and where to find more info about how to open your own Auto Repair Business. Don’t forget you can receive free or low-cost training and free professional business advice, from your local Small Business Development Center! Get a free Auto Repair Business business plan template on our Business Plans page. This Auto Repair Business industry summary is from First Research which also sells a full version of this report. Companies in this industry provide repair and maintenance services for passenger cars and light trucks. Major companies include Bridgestone, Jiffy Lube, Meineke (a division of Driven Brands), Midas, Monro Muffler Brake, and Safelite Group. The US automotive repair and maintenance services industry includes about 160,000 establishments (single-location companies and units of multi-location companies) with combined annual revenue of about $80 billion. The industry is expected to grow at a low rate over the next two years. More consumers replacing their old cars after postponing new car purchases during the recession may contribute to slow industry growth in the near term. Separate industry profiles cover Automotive Oil Change & Lubrication Services and Car Washes, which are included in the automotive repair and maintenance services industry. Demand depends on car usage and the number of cars on the road. The profitability of individual companies depends on convenient location and good marketing. Large companies can maximize use of expensive diagnostic equipment and have advantages in purchasing, distribution, and marketing. Small companies can compete effectively by providing superior customer service or offering specialized services. The industry is highly fragmented: the 50 largest companies generate less than 10 percent of revenue. This Auto Repair Business market research report summary is from IBISWorld which also sells a full version of this report. 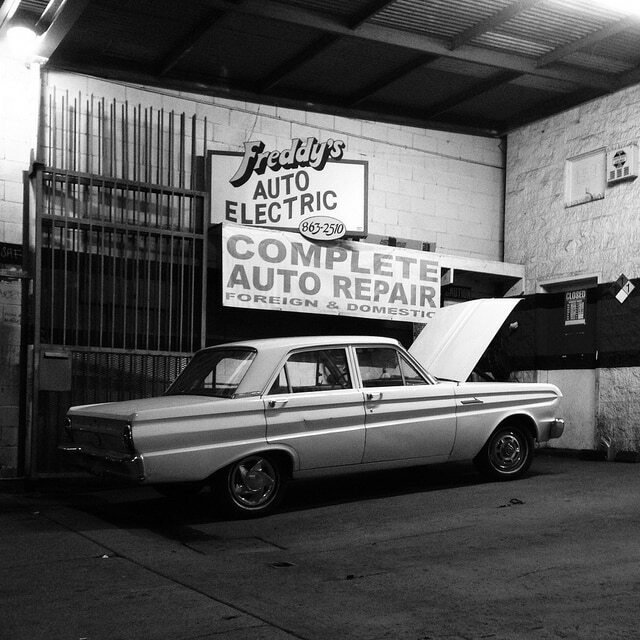 The slower general economic conditions had led many consumers to repair their own cars. 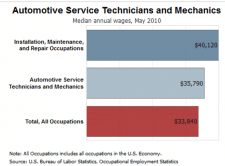 However, the “needs-based nature of the industry,” a recovering economy that is helping grow personal income and reduce the unemployment rate is expected to produce average annual revenue growth of 1.2% over the next 5 years, with auto mechanics industry revenue reaching $54.7 billion by 2017. This increasing demand is forecast to raise the number of repair shop business locations by an annualized rate of 0.9%, reaching 221,033 over the five years to 2017. Stronger demand for automotive repair services is also expected to lead to industry operators charging for services that they offered for free during the recession, which in turn could fuel growth in auto repair business profits. Customer retention was a focus area during the past five years of generally slow economic growth. As auto repair business conditions improve going forward, auto repair shop operators will shift their focus to expanding their customer base by providing quality service. Forecasts for higher personal disposable income suggest that auto repair industry operators will enjoy higher profit margins from services that they previously offered for free or at heavy discounts during the recent recession. Hybrid designs (and other new systems) require additional training for mechanics; sometimes these changes can give auto dealers an advantage, if their teams are trained on a more regular cycle than the local auto repair shop. New designs also can require new diagnostic tools that can be expensive for auto repair shops to acquire. New designs can require less frequent traditional repairs (like tuneups) that are a source of recurring revenue for independent auto repair shops.ages are forecast to increase as a result of this highly trained workforce. During the five years to 2017, wages are projected to increase at an estimated average annual rate of 1.6% to $16.6 billion. Auto repair mechanics who are trained on the the new auto systems can demand higher wages, which auto repair shop operators will need to factor into their repair pricing schedules. The US automotive repair and maintenance services market will grow four percent annually. Mechanical services will remain the largest segment while electronics will grow the fastest. New light vehicle dealers will continue as the dominant service provider while quick lubes, tire stores and repair chains will lead gains. IBIS World segments auto repair business customers into household customers, business customers and government customers. Household customers account for the largest share of auto repair industry revenue (75%). The two principal components of this group are consumers aged 45 and over (35% of total industry revenue), and consumers aged 35 to 44 years (14% of total industry revenue). The household market segment has increased slightly as a percentage of total revenue over the past 5 years. Business customers contribute nearly 22% of industry revenue. This segment includes businesses that depend on motor vehicles for the daily running of the company, as well as taxi and rental car companies, and truck businesses — many of whom can not afford in-house repair and maintenance shops. “particularly independent companies that do not have the option of in-house repairs. Slower economic activity during the recession led to fewer businesses using vehicles to conduct trade, however a resumption of economic growth since 2010, has seen this segment strengthen. Government customers (federal, state, local) make up about 3% of industry revenue. Over the past five years, the share of government revenue has decreased as many governments have been forced to reduce spending. 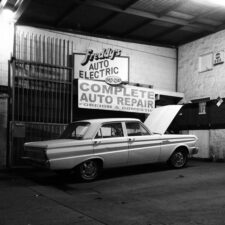 Opening an auto repair shop can be expensive, as seen by some of the startup cost estimates below for major auto repair franchises. A lower cost alternative is to open a Mobile Auto Repair Business. The startup cost for a mobile auto repair business can be less than $2,000, according to Entrepreneur.com. Here is a Auto Repair Business labor market summary from the Bureau of Labor Statistics. Employment of automotive service technicians and mechanics is expected to grow 17 percent from 2010 to 2020, about as fast as the average for all occupations. As the number of vehicles in use continues to grow, more entry-level service technicians will be needed to do basic maintenance and repair, such as brake pad replacements and oil changes. The increasing lifespan of late-model cars and light trucks will further increase demand for qualified workers. However, continuing consolidation in the automotive industry may lessen the need for new mechanics. Job opportunities for qualified applicants should be very good as some employers report difficulty finding workers with the right skills and education. Jobseekers who have completed formal postsecondary training programs—especially candidates with training in advanced automotive technology, such as hybrid fuel or computer systems—should enjoy the best job prospects. The majority of job openings will be in automobile dealerships and independent repair shops, where most service technicians currently work.